The most interesting game was a derby match between two local teams from Atyrau: Barsy Atyrau (#2) and Barsy 2 (#6). Barsy 2 was smashed at home by 36 points 73-109 and even the fact of playing on their own court did not help. Barsy Atyrau (26-9) have an impressive 15-game winning streak. They maintain second position having three points less than leader Astana. Barsy 2 lost twelfth consecutive game. Newly promoted team keeps the sixth place with 30 games lost. Barsy Atyrau are looking forward to face bottom-ranked Kaspiy Aktau (#7) on the road in the next round where they are favorite. Barsy 2 will have a break next round. Another interesting game was again a derby between two teams from Atyrau: Barsy Atyrau (#2) and Barsy 2 (#6). Barsy 2 was smashed at home by 47 points 62-109 and even the advantage of their own court did not help. Barsy Atyrau (26-9) have an impressive 15-game winning streak. They maintain second position having three points less than leader Astana. Barsy 2 lost twelfth consecutive game. Newly promoted team keeps the sixth place with 30 games lost. Barsy Atyrau will play against bottom-ranked Kaspiy Aktau (#7) on the road in the next round where they are favorite. Barsy 2 will have a break next round. 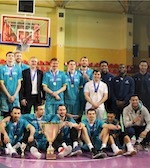 Very significant was Astana's (#1, 32-0) victory against 4th ranked Tobol (19-14) 91-72. Undefeated Astana (32-0) have an impressive 16-game winning streak. Defending champion maintains first position with a perfect record of 32 victories in a row. Tobol at the other side keeps the fourth place with 14 games lost. Astana will meet at home Sinegorie K. (#5) in the next round. Tobol will play against Almat.Legion in Alma-Ata and it may be a tough game between close rivals. Very significant was Astana's (#1, 32-0) victory against 4th ranked Tobol (19-14) 93-76. Undefeated Astana (32-0) have an impressive 16-game winning streak. Defending champion maintains first position with a perfect record of 32 victories in a row. Tobol at the other side keeps the fourth place with 14 games lost. Astana's next round opponent will be Sinegorie K. (#5) in Kokshetay. Tobol will play on the road against Almat.Legion in Alma-Ata and it may be a tough game between close rivals. The game in Aktau was also quite interesting. Second ranked Barsy Atyrau (26-9) played at the court of 7th ranked Kaspiy Aktau (4-30). 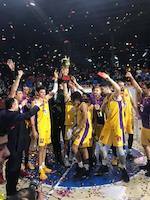 Barsy Atyrau managed to secure a 6-point victory 76-70 on Thursday. Barsy Atyrau have an impressive 15-game winning streak. They maintain second position with 26-9 record having three points less than leader Astana. Kaspiy Aktau lost third consecutive game. They stay dead last with 30 lost games. Barsy Atyrau will have a break next round. Kaspiy Aktau will play again at home against the league's second-placed Barsy Atyrau (#2) and hope to win that game. Very significant was Astana's (#1, 32-0) victory against 4th ranked Tobol (19-14) 91-72. Astana (32-0) have an impressive 16-game winning streak. Defending champion maintains first position with a perfect record of 32 victories in a row. Tobol at the other side keeps the fourth place with 14 games lost. Astana will meet at home Sinegorie K. (#5) in the next round. Tobol will play against Almat.Legion in Alma-Ata and it may be a tough game between close rivals. Very significant was Astana's (#1, 32-0) victory against 4th ranked Tobol (19-14) 93-76. Astana (32-0) have an impressive 16-game winning streak. Defending champion maintains first position with a perfect record of 32 victories in a row. Tobol at the other side keeps the fourth place with 14 games lost. Astana's next round opponent will be Sinegorie K. (#5) in Kokshetay. Tobol will play on the road against Almat.Legion in Alma-Ata and it may be a tough game between close rivals. Aktobe and Kazygurt reached the Higher League Finals as they won their semifinal clashes. Kazygurt beat Irtysh 95-64 and 88-69 to sweep the series. Aktobe meanwhile needed a decisive 75-72 win to seal the victory. They trailed 7 points at the halftime, but used a massive 26-17 surge in the last stanza to win the game. Dzunusov top-scored for the winners with 23 points and Sergey Bormatenkov (191-F-91) netted 16.